Riparian vegetation monitoring is conducted as part of IHAP. This includes mapping vegetation at all of the recently completed channel rehabilitation sites and conducting band transects at eight of these sites. Measures of vegetation include: structural complexity, extent, species richness, age diversity, and floodplain regeneration and function. The data will help determine whether riparian management targets are being met. Overall, riparian vegetation has responded similarly at many of the recently constructed bank rehabilitation sites where narrowleaf willow is the predominant woody plant. Restoration flows appear to inhibit hardwood seedling establishment along the 450 cfs water surface, but have been insufficient to promote hardwood establishment on constructed floodplain surfaces. Root sprout growth from roots that remained after construction has not been inhibited and it is unlikely that the root sprouts will be scoured from the low water’s edge. Root sprouts will ultimately exert more of a geomorphic influence than seedlings in their potential reformation of a riparian berm. These river-edge root sprouts are unlikely to be removed by flood flows and have the ability to trap fine sediments. It is important to monitor these root sprout areas to determine whether their greatest influence is to inhibit channel movement and to potentially cut off floodplain inundation, or to provide important Trinity River edge habitat for juvenile fish. As surveyed in 2003, riparian habitat was again surveyed in the upper 40 miles in 2008 and ’09. Cover, height, and density class data were recorded for all initiation stands. Preliminary analyses indicate that white alder coverage has diminished since 2003 and has been replaced by mixed willow and riverine habitat. Reductions may be due to scour from increased restoration flows and aging of white alder, whose lifespan is typically about 40 years (they originally encroached on the channel in the mid-1960s). Mapping of willow stand initiation will be used in ongoing monitoring to evaluate processes of scour and deposition at or below the ordinary high water mark. One wildlife objective is to enhance the quality and maintain the quantity of riparian bird nesting and foraging habitats. To test progress towards this objective, bird abundance and species diversity is measured at a selection of temporal and spatial scales across the 40-mile river reach. Monitoring trends can determine if populations and species diversity are being maintained along the river. As reported in 2009, trends in abundance over eight years for the five target species showed significant increases for four of the five species: Black-headed Grosbeak, Song Sparrow, Yellow-breasted Chat, and Yellow Warbler. Trends varied by species at the sampling reach scale. Analyses are focused on reach-scale trends and their relationships to habitat changes resulting from implementation. 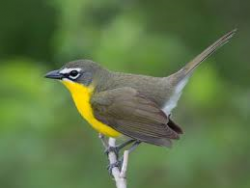 Analyses to determine whether the current sampling enables the Program to detect changes in bird population measures have also been completed. The current sampling effort and distribution of sampling locations is considered sufficient for a 90 percent probability of detecting trends over five to ten years. Monitoring abundance and productivity of a set of target riverine birds assesses progress toward enhancing their quality and quantity of habitat. In 2009, Eight years of river-float surveys were analyzed to identify trends in abundance for nine species. 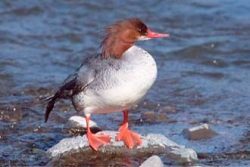 Significant trends include: declines in Common Merganser abundance during the breeding season and during the fall; declines in Belted Kingfishers during the breeding season; and increases in American Dippers and Green Herons during the breeding season. Trends for all species are being further analyzed. The cold temperatures maintained in the Trinity River are beneficial to fish but may be problematic for foothill yellow-legged frogs. TRRP assesses foothill yellow-legged frog breeding distribution, timing, and survival of egg masses. In 2009, 50 egg masses detected in the mainstem river between Lewiston Dam and the North Fork Trinity River. This was the highest count since egg mass surveys began in 2004, and several of the breeding sites were at restoration sites below Canyon Creek . However, it is still minimal compared to some tributaries. 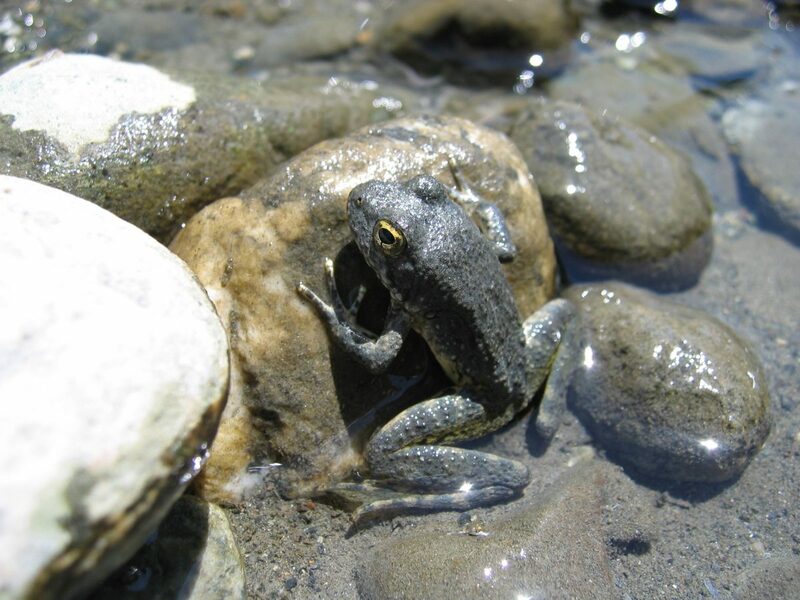 Tributaries and the mainstem with colder water had later onset of egg laying and emergence of smaller froglets when compared to warmer tributaries. While relative abundance on the mainstem has increased over the previous four years, reproductive effort is still substantially less than observed on the South or North Fork Trinity River. There are indications that western pond turtle populations are somewhat different from those on tributaries. Populations are being monitored and the reproductive implications of the smaller adult body size of western pond turtles observed on the mainstem are being assessed, particularly in comparison with the South Fork Trinity River. Proportions of females with eggs is low on both river forks and generally only larger turtles have eggs. 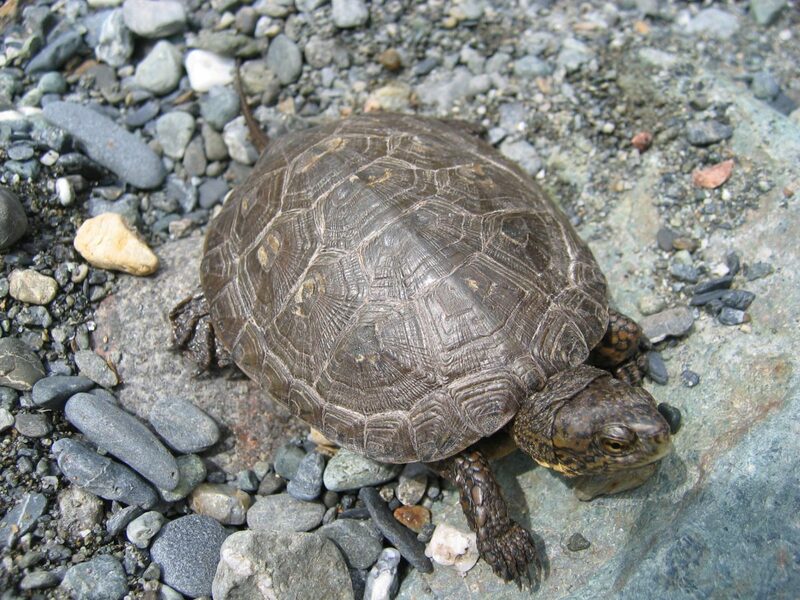 In 2009, only two egg bearing females were detected on the mainstem (9.5%) and these were both older turtles originally captured and marked in the 1990s. On the South Fork, four relatively large gravid females were detected (16.7%). TRRP is concerned with a number of invasive species issues on the Trinity River. Channel rehabilitation actions employ various measures to reduce weedy exotic plants. Wetland enhancements are designed both to benefit native species such as Western Pond Turtle and to reduce the prevalence of the invasive Bull Frog. These and other invasive species issues are a focus of the Riparian and Wildlife Work Group. A lack of large wood, resulting from low historic flows, extensive logging and mining activities, and the upper Trinity being cut off by Trinity Dam, has eliminated a valuable component of salmon habitat. Large wood has been installed at most TRRP rehabilitation sites on the Trinity River. Surveys are conducted as part of the Integrated Habitat Monitoring Project (IHAP) to understand how wood interacts with flows and rehabilitation features.